A couple of days ago, Dan took Raven down to our dock to throw the stick into the water a few times for her. Since becoming a bonafide water dog, she takes to the water like a fish and it’s easy to give her a good exercise while simply standing on the dock tossing sticks. While we have some small misgivings about her splashing around in the shallows there, it seems better than having her running around loose in the woods. We’re simply not capable of giving her sufficient exercise through walks on a leash, she’s just got too much energy to burn. We do, however, make an effort to keep her to the north side of our bay. 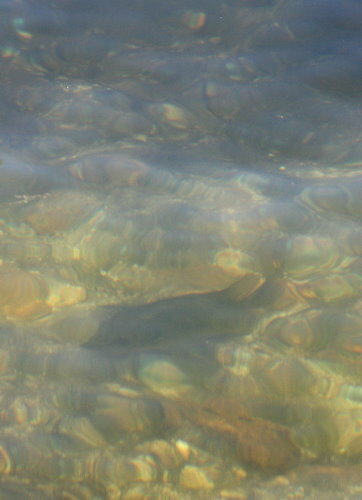 Last summer, when we moved in, we noticed some bare circular patches in the gravelly shallows along the south edge of the bay. We knew right away that these were spawning beds, though without the fish on them we couldn’t say for which species. With the weather, and therefore the water, beginning to warm up, it’s about the right time for most species to start spawning. A couple of weeks ago we noticed some activity in the shallows around our dock, a bit of splashing and some dorsal fins poking up from the water’s surface. This occurred for two or three days, and then the water was quiet again. We never did determine which species was involved there, though they were smaller fish than the pike I’d seen earlier in the spring. We’d been keeping a casual eye on the spawning beds off our shoreline, and knew they would return eventually, so it didn’t come as too much of a surprise when Dan called up to me that afternoon, “The fish are bedding!” I was quick to grab my camera and head down to try for some photos, unable to quell a little bit of excitement about the event, having never observed it before. There’s also something neat about it happening in your own backyard. I ran off a few dozen photos, trying for at least one or two that might show the fish clearly enough to be able to identify the species. Unfortunately, it was a somewhat breezy day, and the ripples on the water’s surface distorted the fish’s shape, making it difficult to tell (at least in the photo) that the object was even a fish, much less of what sort. Complicating matters was that the water’s surface reflected the clouds in the sky, causing sufficient glare to wash out the objects below the surface. I did my best, but didn’t come out with much. I returned this afternoon, hoping that the slightly calmer wind conditions might allow me to get a better photo. Unfortunately, the water’s surface was still as washed out as the first time I tried. 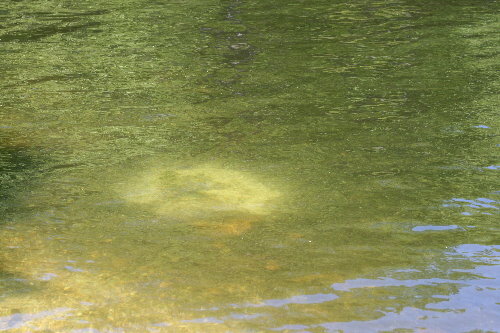 There were some areas near the shore that reflected the dark canopies of the overhanging trees, and in these spots one could clearly see down to the bottom – but naturally, there were no fish beds there. Where the beds were left me, standing on the shore, at too oblique and angle to avoid the glare. The fish are very skittish, dashing off the bed at the first sign of shadow, so I wouldn’t even be able to take the canoe over. Ah well. You get the idea. I was only able to definitively determine the species of one of these fish, and it was just by chance, as I was reviewing the photos. Notice that in this one you can see that his eye is bright red (I’ve saturated the colours here to accentuate it). In our waters, there’s only one species of fish with a bright red eye: Rock Bass, Ambloplites rupestris. Below is a photo of a Rock Bass taken last summer, where you can better see the eye and scale pattern than when it’s in the water. 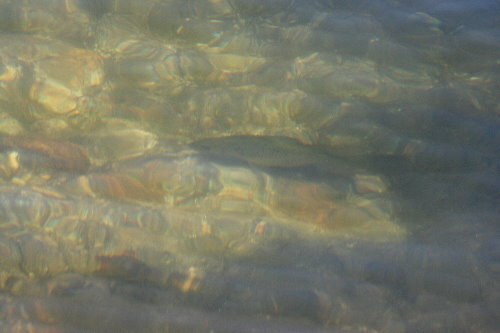 It’s amazing how camouflaged fish are in the water, considering what they look like when you pull them out. For most fish, when they start to spawn depends on the water temperature, and so the exact timing may vary from lake to lake, depending on the depth of the water and various local conditions. Pike are the earliest here, spawning when the temperature of the shallows reaches 10 oC (50 oF), usually not long after ice-out. 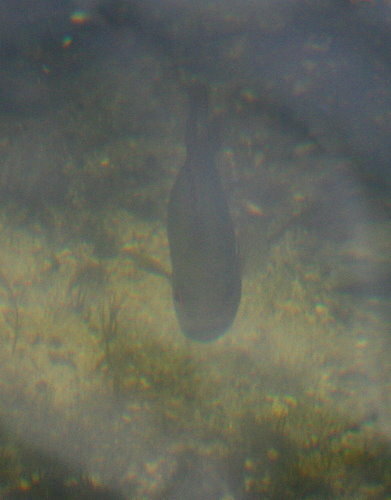 Rock Bass need slightly warmer temperatures, at around 15 oC (60 oF). The sunfishes, Pumpkinseed and Bluegill, need the water to be at least 21 oC (70 oF). The division in temperature requirements means that probably, for the most part, the species are temporally separated from one another in when they spawn, and you’re not likely to find sunfish spawning with Rock Bass, for instance. I’m not sure if they’ll use the same beds once the other fish clear out, or if everybody makes their own, but clearly they clean up and reuse beds from previous years since all of the ones along our shore are occupied this spring. Depending on the species, a single female fish can lay thousands of eggs. 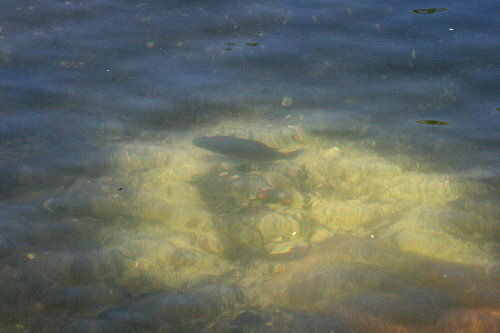 Female Rock Bass lay an average of 5,000 eggs, with high counts reaching 11,000 per individual. Bluegills, however, may lay as many as 38,000 eggs per female. Since sometimes two females may lay in the same bed, there can be up to 60,000 eggs in a single bed. Bluegills, unlike other fish, have the potential to overpopulate a lake as a result, and when things start to get a bit crowded growth rates slow down. I don’t think the other species have the same problem. In the case of all species, the majority of those eggs are going to be eaten before they ever reach maturity. The beds are guarded by the male fish, once the female has laid her eggs and left. He protects it from predators, never straying far, and also aerates the eggs by fanning water of them with his fins. The eggs hatch in two to five days, partly depending on water temperatures and the particular species in question, during which time the male eats only what happens to enter the area around his spawning bed. This is why catching fish on spawning beds is so easy. 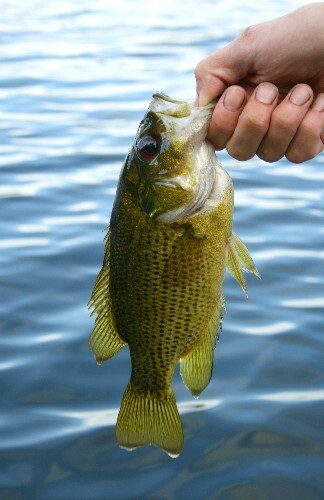 Although fishing spawning Largemouth Bass and other large sport fish is illegal, sunfish are open all year. Fortunately, they don’t appeal to very many people. I suppose the easiest way to confirm the identity of the species, if I really wanted to know, however, would simply be to pull out my fishing rod. I suppose I’ll have to keep an eye on the beds, watch for when these guys leave and disperse, and see if I notice anyone else come in to take their place. I didn’t know rock bass and blue gills were different species, so there you go. We always called them pumpkinseeds because of the black mark on their side (you can see it in some of your photos). 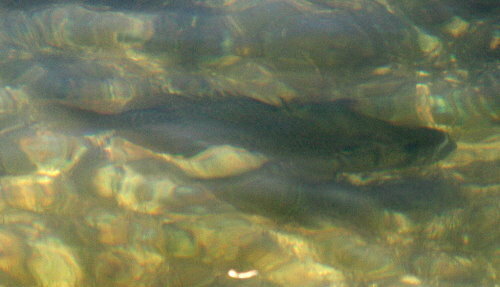 The small and large mouth bass are on their nests right now too, they like to be about 6 feet off our shore. If you see someone fishing the shoreline, they are trying to get the bass (illegally I might add, and that is where a camera comes in very handy). And pumpkinseed are another species again. I was surprised at the variety of species in our lake when Dan introduced me to fishing. I covered the variety of fish in two posts last August (first post, second post). Here in Kingsford I tallied seven “macro” species (that is, not including the minnows and such). If you roll in species from nearby lakes that we haven’t caught, I believe there’s eleven.